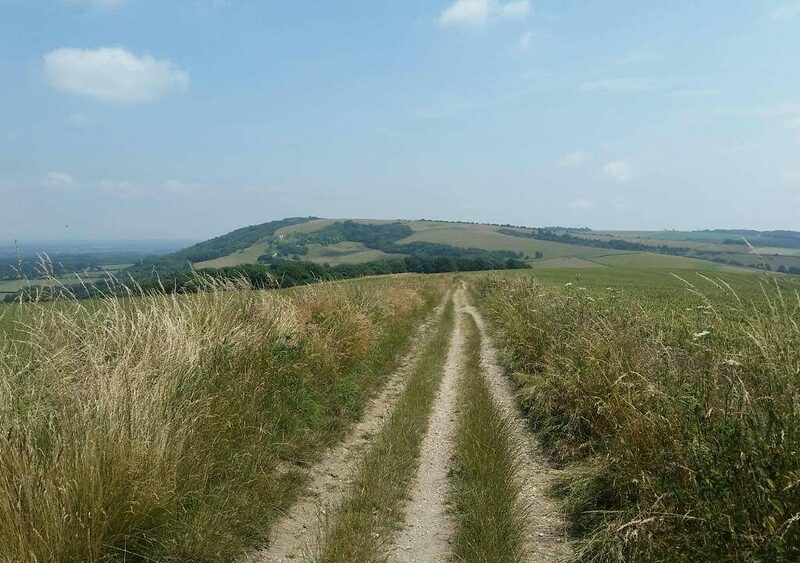 Our colleague Sue recently walked the South Downs Way with the aim of enhancing her knowledge of the route as well as getting to know a handful of our fabulous accommodation providers. Sue was joined on the walk by her husband Mike. We arrived in Winchester last night to find the city buzzing with life. It was the HAT fair weekend when there are many artists providing different kinds of free outdoor and street entertainment. There was a great atmosphere. This morning, after a fabulous breakfast at our accommodation, we headed to City Mill for the official marker at the start of the trail. Following the river and a lane we left the city, crossing the M3 motorway and entering the countryside. Today’s walking was often on tracks and quiet lanes. We passed through several short sections of woodland. Very welcome shade as it was a warm day. The fields of Barley we passed through are golden and looking down into the Meon Valley from Beacon Hill the grassy fields there were still green despite all the warm weather lately. We saw lots of butterflies along the way particularly around the meadow flowers and grasses by the path. Unfortunately I wasn’t able to get a picture of any as they didn’t stay still long enough. We made a couple of stops. A small detour took us to the small Norman church at Chilcomb. Typical of it’s time it is a fine example to have survived this long. We also made a brief stop at The Milbury’s pub. As we were passing right by the door, it seemed rude not to. This too is a building with history but more importantly for us today, it served cold drinks. On arriving at tonight’s accommodation we were given a warm welcome by our hosts and a big bottle of water. It couldn’t have been better. Today we have walked from Exton to South Harting on the South Downs Way. We made our first short detour to see the earthworks of the Iron Age hill fort on Old Winchester Hill. There were fantastic views out towards the Isle of Wight, a little hazy today but we could still see the island in the distance. We also looked back at Beacon Hill which was near the end of yesterday’s walk. The route was now following the ridge of the downs. The chalk under the grass was clearly visible along some sections of the path. At Wetherdown our attention was caught by flying things. Firstly, there were model aircraft being flown in a neighbouring field, and secondly the butterflies were out in force. I finally managed to photograph a butterfly that was happy to pose for me. We made another short detour to the top of Butser Hill and found a shady spot with a view to eat our packed lunches. After descending from Butser Hill we spent much of the afternoon in cooler, shady woodland. Firstly on paths through Queen Elizabeth Country Park and then on lanes and tracks from Buriton to South Harting. Today it felt like we had a proper introduction to the downs and there is more to come over the next few days. We needed our good breakfast this morning as today was the longest day on our itinerary. Well fed by our accommodation we set off towards Harting Down. The views were fabulous looking back down at South Harting in the valley and across to the ruined tower on a hill nearby. We then took the direct route over Beacon Hill. It is a steep climb and the main path goes around the hill. The views out to the Isle of Wight were worth the effort of the climb. The view was a bit hazy again but you could easily pick the island out. We are getting amazing views so far during our walk. A brief stop to look at the Devil’s Jumps, a row of Bronze Age Burial mounds, then on to Cocking. There were more great views of the South Coast from Cocking Down on the way there. The agricultural side of the South Downs was evident at times today as we walked through or beside some large fields of crops. Gold and green patchwork patterns. We found a large shady beech tree near Graffam Down to sit under while we had our lunch. Then after passing through some fabulous woodland we carried on over the grassy fields of Slindon Estate arriving at our accommodation to a warm welcome and lovely chilled water. Today’s walk was from Amberley to Upper Beeding. We had a lovely breakfast then headed off on the second half of the trail. Quite soon we were climbing up onto the downs again having crossed the Arun river valley. We saw the trig point for Rackham Hill but if there was a gate into the field we missed it. The sheep were it’s guardians. There are some great views along this section of the path which is fairly flat but does have a few small ups and downs. We passed through more fields of crops on our way towards Washington after which there was a steep climb to Chanctonbury. We stopped to look at the dew pond which did still have water in, and continued to Chanctonbury Ring. The trees of Chanctonbury Ring were damaged by a storm in 1987 and some were replaced. With the light through the outer ring of trees today it looked beautiful but it is said to be haunted so after a short rest in the shade we continued towards the safe haven of tonight’s accommodation. Today we didn’t have as much tree cover overall and took it quite slowly in the heat, drinking lots of water as we walked. 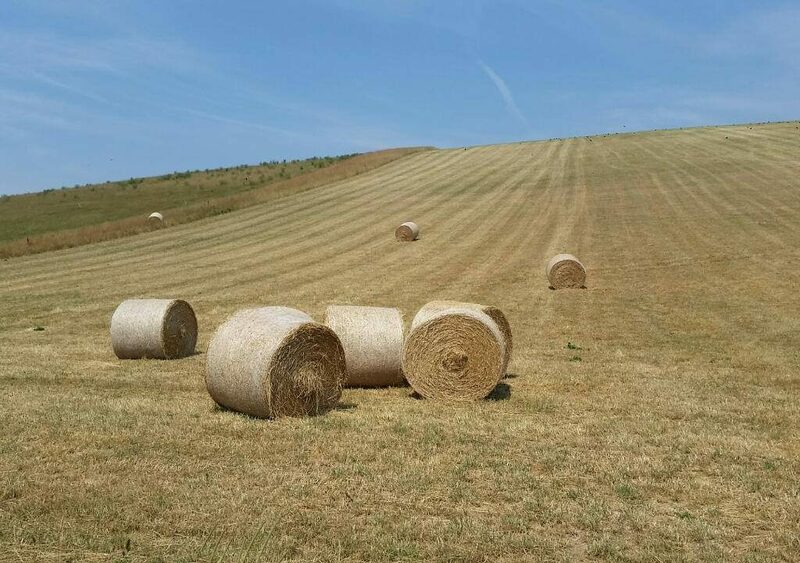 Today may not have been as hot as others but it felt like it as we walked from Upper Beeding to Kingston-near-Lewes. The humidity was high and the views from the Downs not as clear as previous days. We saw several storm clouds forming over the high ground around us but any rain must have fallen elsewhere as we stayed dry all day. We climbed up Truleigh Hill to start our day. 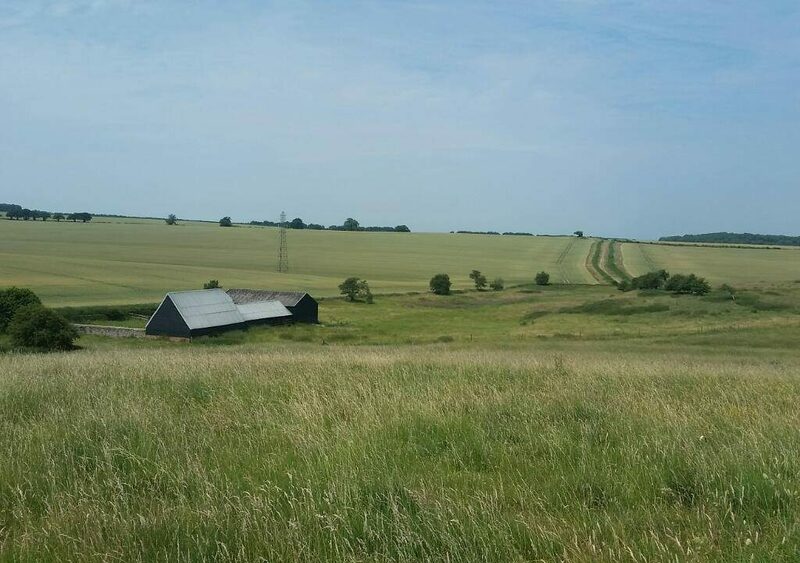 There were some lovely views back along the route we had walked yesterday and also down to Upper Beeding. It was then up a little more as we walked along the top of the Downs to Devil’s Dyke. Devil’s Dyke is a steep and narrow valley. You get great views along it on the road to the pub nearby. 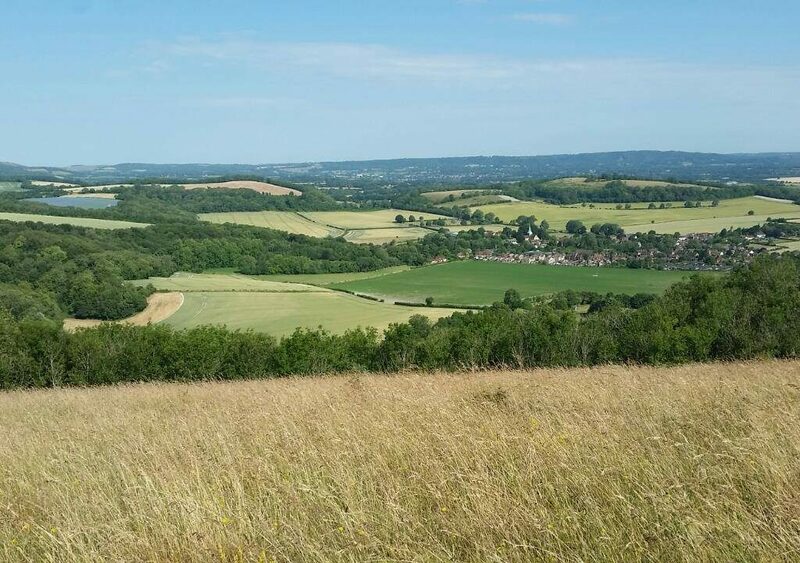 From the pub there are also fabulous views over the Sussex Weald, a view much enjoyed by the artist Constable. Sadly we were too early to stay for a drink and still had a long way to go. From Pyecombe we climbed steadily up through the golf course back to the high downs and Ditchling Beacon. The views were again fabulous. Soon after this we started the loop round to Kingston. There was a last climb through fields before turning off the trail for our descent to Kingston. A short taxi transfer and we were dropped at the door of tonight’s accommodation. We started our penultimate day with another fabulous breakfast before our taxi transfer from Lewes back to the path at Kingston-near-Lewes. We had a climb to return to the trail but then had great views back down to the village and Lewes beyond. We walked through some large fields along the ridge towards Southease and watched paragliders flying across the valley on Mount Caburn. 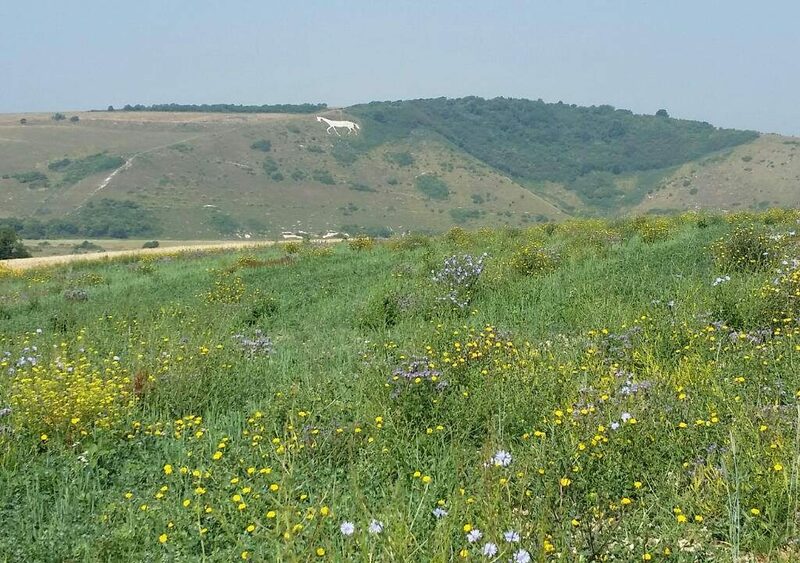 Mount Caburn is the only part of the South Downs not covered by the South Downs Way, it is also famed for its butterflies but we were much too far away to see those! Southease has a small Saxon church with an unusual round Norman tower. There is also a water tap so we topped up our supplies before continuing. 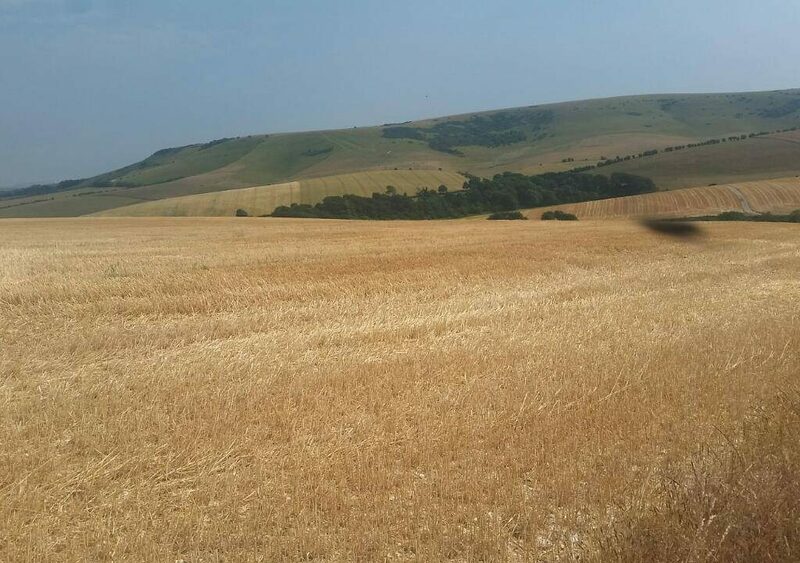 We now climbed back onto the Downs ridge line passing Firle Beacon. The views were fantastic. On one side the Low Weald of Sussex and on the other a more hilly view towards the coast. As we made our descent into the pretty village of Alfriston we passed Long Burgh Barrow. This is one of the largest long barrows in Sussex and dates back to 3400-2400 BC, the early and middle Neolithic periods. With a late afternoon arrival at our accommodation we were able to relax with beautiful garden views before going back into Alfriston to explore a little more. Today was very hot. There was not much shade so we were happy to have good hats which we soaked with water when we could. It really helped to cool us down. We set off from Alfriston down the Cuckmere Valley, it was exciting to see the sea getting closer as we roughly followed the line of the river. Our route was a bit more up and down than that of the river, but this had the advantage of positioning us for some more fabulous views today. We reached the sea above Cuckmere Haven and could see the chalk cliffs running into the distance ahead of us. The Seven Sisters were looking good. There were several short steep ups and downs as we followed the path along the cliff tops. The views were stunning. The South Downs Way really but on a show for this final leg. As it was hot we felt justified with our ice cream from the van at Birling Gap. We decided it counted as a necessity in the heat! Soon we were making the climb up to Beachy Head. It was the longest climb I think but watching the boats at sea took our mind off it . From Beachy Head it is downhill to the trail end at Eastbourne. We have had an amazing week with views that showed the outstanding beauty of this area. Something new to us as we haven’t really visited here before. 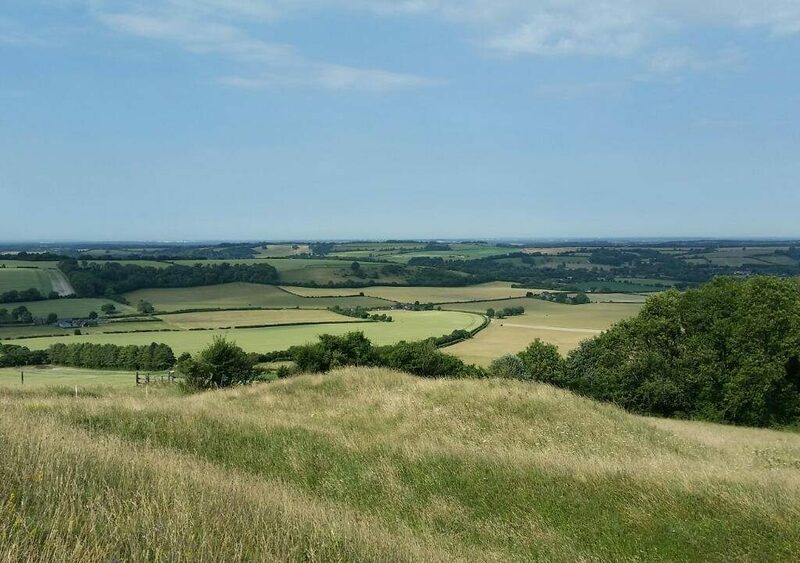 Mickledore can arrange itineraries for you to walk the full South Downs Way path, the western or eastern half, or even a shorter break for a circular walk of the final section. From what we have seen I can certainly recommend walking here.